In 2014, Edu Marín took on the most challenging project of his life: climbing “Panaroma”, the legendary route freed by Alex Huber in 2007, with his 62 year-old father, Francisco Marín “Novato”. 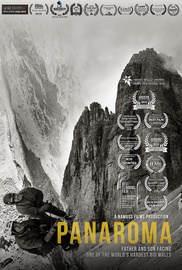 In July 2014, Edu Marín took on the most challenging project of his life: climbing “Panaroma”, the legendary route freed by Alex Huber in 2007, with his 62 year-old father, Francisco Marín “Novato”. Located in the Tre Cime di Lavaredo National Park, the 500m line is graded 8C, making it one of the world’s hardest big walls. The demanding nature of the climb, the psychological commitment involved and the ever-changing weather means that only a handful of parties have managed to reach the summit. In addition, the recent fall of some blocks in some of the most engaging sections has prevented any climbers from completing the route. In this film, father and son enter the heart of the Dolomites, taking their lives into their own hands with the hope of accomplishing an unprecedented sporting feat which will place them among living climbing legends.